The most important difference to stone lithography is that the original motif is not drawn in reverse. Using lithographic ink and crayon you draw directly onto a corn-surfaced aluminiumplate. You can work in various ways, even using thin washes of ink. It is also possible to work on matt transfer films and transparent paper with ink, crayon or copy markers. Collages, frottages and even direct photographic transfers of material structures onto the plates can bring fascinating results. On top of this you may bring photographed motifs, typographic film and raster film into play. The plates are as easy to transport as paper and can even be taken out of doors. 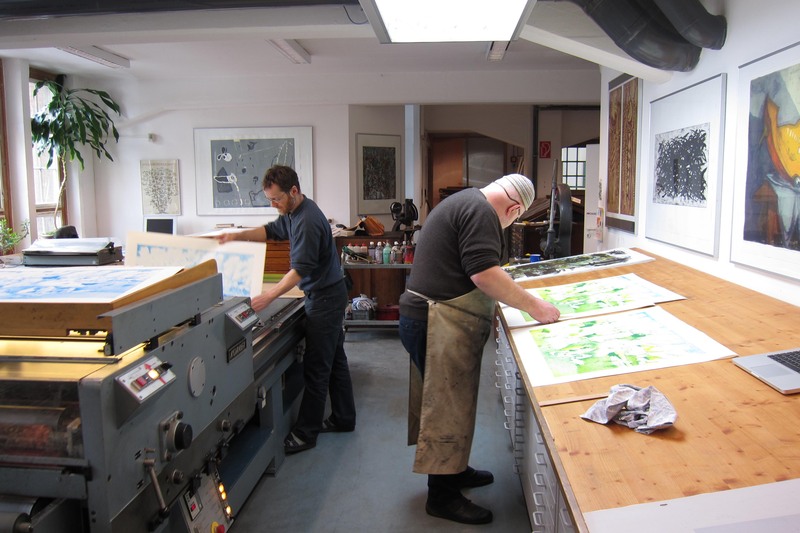 During the printing you can manipulate how the plate, the colour and what sort of paper is used. Algraphy is comparatively inexpensive as a basis for more complex stone lithographs, etchings and relief prints. We use a KORREX-proofprinting press with maximum paper format is 79 x 107 cm, under certain circumstances up to 100 x 140 cm. Directprint on KRAUSE and RICHARDSSONS-copper printing presses with a maximum paper format up to 110 x 160 cm. It is possible to employ the Duplex or the 4c colour system even using thick deckle-edged etching papers. To be most faithful to the original the half tones may be reproduced using a frequency modulated raster and can be printed on CTP plates on a KORREX-proofprinting press. Each colour may be individually adjusted during the printing process. The maximum paper format 79 x 107 cm, under circumstances up to 100 x 140 cm.